On an average, humans spend one-third of their lives in bed (assuming they sleep 8 hours every night). Hence it’s important not to underestimate the importance of a good bed. A bed like a car is a long term investment. And it helps when you make the right choice at the start. The size and length of a bed are other factors that will affect your choice. The bed needs to be long and wide enough to suit your partner and you. No point having to cram up when you’re trying to have a good night’s sleep. Undoubtedly the mattress plays a vital role in this entire process. A good mattress brings adaptability and helps you and your partner adjust to the firmness of the mattress with time. 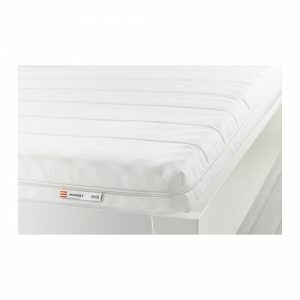 Moreover, good quality mattresses generally last 8-10 years. Before buying one, also check the return policy so you don’t have to stick with a bad choice. It’s important to put a bit of thought into buying a bed. Sleep is a vital part of a healthy routine and a lack of it can cause well documented hip mattress, back and neck trouble. Keeping in mind the above mentioned factors, you should drop into the IKEA store and check out some of the double beds and mattresses we have. Sturdy and comfortable, our mattresses make for a quality addition to your bedroom. Our beds also offer built in storage space and come in a variety of styles. Valentine’s Day might have passed, but this would make for the perfect belated gift. A nice way to surprise your partner and secure a good night’s sleep for years to come!